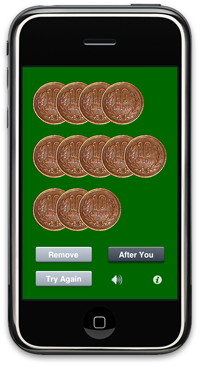 This is an iPhone/iPod touch version of the classic coin puzzle. There are three rows of coins: 3, 4, and 5. 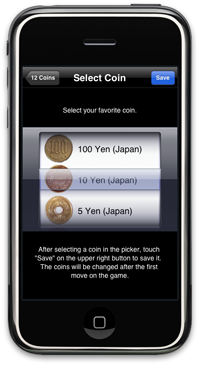 Take turns removing coins from each row. You can go first, or let the iPhone start the game by pressing "After You" button. Touch on the coin to select it. Remove any number of coins, but only from a single row at a time. The one who takes the last coin loses. For your playing pleasure, we gathered 22 different coins!